UML Lab is the first Modeling IDE to seamlessly combine modeling and programming with an intuitive UML diagram editor and next-gen round-trip engineering. Import your software project and get a nice overview via UML within seconds. Experience truly agile modeling and coding within your Eclipse IDE. In short, UML Lab helps you develop great software. Visit our website for more information, pricing and to download a FREE 30-Day Trial of UML Lab. Annual licenses are available from EUR 199 including support and updates; Academic Licenses are free. Missing some information? Post your question in our forum or contact us and follow the latest Yatta News on Twitter (e.g. UMLlab ) and Facebook. Please note: Some SWT compatibility issues with Eclipse 4.x under Mac OS X. We are working on a solution. For the time being, we suggest using UML Lab in Mac OS X only with Eclipse 3.x. Thank you for your understanding. 2 Cannot continue the operation. There is another install operation in progress. By adding the following code below to your website you will be able to add an install button for UML Lab Modeling IDE. Wanted to know if supports C-coding language. currently UML Lab comes with built-in support for Java and PHP. UML Lab uses XPand templates for the code-model mapping. By creating your own templates for the C language, UML Lab can be extended with C language support. 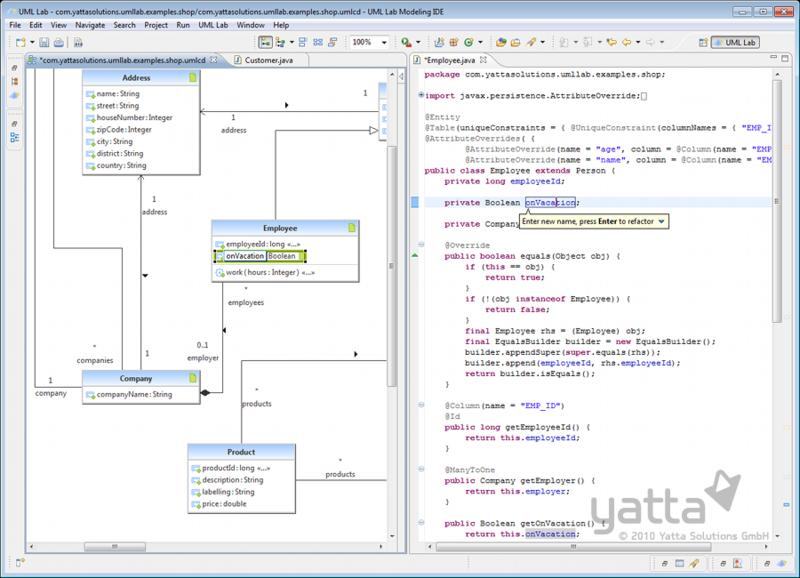 If you need support with integrating your custom templates into UML Lab, feel free to contact us at info@yatta.de.